Effective long-term river management depends on a comprehensive understanding of the past and present natural and human processes operating throughout the watershed. John Field's expertise and insight have helped in the development of a geomorphology-based approach to river management. As an accomplished teacher John Field is able to clearly and succinctly explain the results of his studies in a manner understandable to all. Explore the principles of fluvial geomorphology in this short course designed for those dealing with flooding, erosion, and habitat issues along rivers and streams. The course will provide the necessary knowledge and skills for understanding a river's response to various natural and human alterations of watershed conditions. 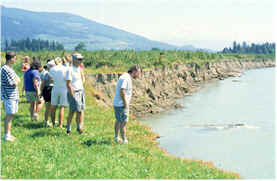 Both the class and field trip components of the course will help participants recognize unstable channel reaches in a watershed and determine the appropriate stream restoration techniques to employ in various settings. with an optional field trip on April 28. John Field received a PhD from the University of Arizona in 1994 with concentrations in fluvial geomorphology and hydrology. During eight years as a university professor, Dr. Field received excellence in teaching awards from the Geological Society of America and Western Washington University. His research on flood hazards and habitat issues in Arizona, Washington State, and New England has been published in numerous scientific publications and presented at professional meetings throughout the United States and Canada. Dr. Field's thorough knowledge of the scientific literature and wealth of practical experience in watersheds around the world provides a sound basis for identifying sensible solutions to watershed problems. Copyright © 2017 Field Geology Services. All rights reserved.